The training program started after a grand inaugural. The Topic of training was “Effective Parenting”. My audience comprised of Ladies. I started the program with Self Esteem of a child. The ladies opened up and started interacting with me. Few Jaycee Members were also present. One of the past President questioned me a lot. He questioned me on every topic which was being discussed. It was a great learning experience for me. I learned how to handle tough participants. He tested my mettle to the maximum limit. I did not give up and tried my level best to address all his questions. At the end he was satisfied. The participants also answered each others questions. They all shared there experience. My knowledge got enriched and i got a lot to learn. I remember one of the parents telling me that whatever they do they should teach the right thing to their child. I told them that action speaks louder than words and the children will learn more from what their parents do and practice rather than what they tell. I talked about the importance of Communication, Self Esteem, parenting Style and being a role model for their kids. The audience responded very well and they came up with lots of questions which continued even after the training session got over. The session ended and i left my email id so that they implemented what they learnt in the training program and mailed me their feedback. Jcrt Chairperson came to see me off till left the destination. I was touched by their hospitality. 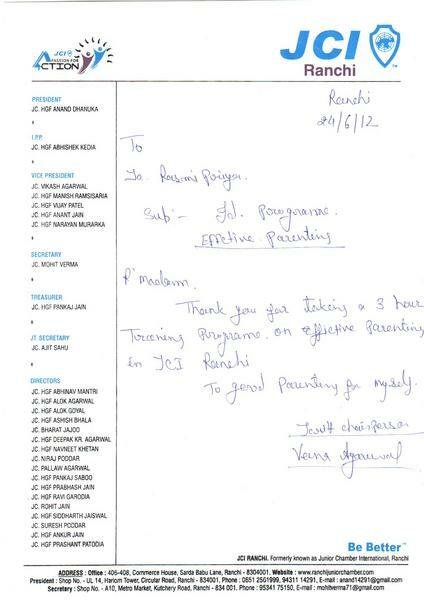 Thank you JCI Ranchi for giving me an opportunity to conduct Effective Parenting training program at your chapter. I would also like to thank Jcrt Chairperson, Veena Agarwal, President JCI Ranchi, Anand Dhanuka, Past President , Abhishek Kedia. I would like to lend my special thanks to my Father Prof T.P Mandal who accompanied me to Ranchi. Thank you Papa for being the biggest support of my life.